A SteamRep forums poster thinks he may have uncovered a Team Fortress 2 Buds conspiracy. 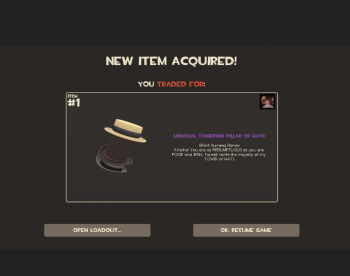 Allowing real currency transactions in a game economy always has the potential for fraud, and one Team Fortress 2 enthusiast thinks he may have uncovered a Russian conspiracy to launder money by selling Earbuds - a decorative item with high cash value but little utility - to the game's community. The user, who goes by the name base64 and has a Department of Defense logo in his profile, claims that this activity has been going on for some time. He first noticed it when going over the volume of Bud sales and saw a sudden activity spike, way over and above the norm for trades in this item. Going over the sales, he discovered that the trades could be traced back to a user who was cashing out in Russian Rubles for less than the Buds cost him, and using bulk purchased Keys bought from Valve to do it. The accounts carrying out these trades were effectively puppets; they bought nothing but Buds, didn't participate in matches, and cashed out quickly. They had no interest in the Mann Co Packages that were sent out to Key buyers, and frequently just gave them to the people they were trading Buds for. All they wanted were Buds, possibly because they believed that the items - not being weapons or other premium pieces - wouldn't get Valve's attention. Since they bought Buds with Keys for more than the Buds were worth, and cashed out for less than the Keys were worth, the possibility exists that the Keys were bought with stolen credit cards. It's a neat way to launder cash quickly, in other words, if you happen to be sitting on a few hundred dollars worth of someone else's credit. The full details can be found here, if you're keen on checking base64's math.